L'Oreal's bottle is prettier with a similar pump mechanism. Like Olay, the product is in an opaque container, which helps keep the contents from being affected by light and oxygen. The bottle's a bit taller but product amount is the same. 1. It's much thinner than the Olay day cream, so I feel like I need to use more of it to get the true UV protection. 2. It has a really strong scent. If you're sensitive to fragrance, the RevitaLift product is not for you. I actually don't like the scent of RevitaLift and noticed when I first put it on, there was a slight tingling sensation. A quick check on Paula's Choice website helped me learn that there could be some irritants in the product. If you have sensitive skin, you may want to look for a different day cream. What's great is the SPF 30 sun protection and that my face doesn't look lighter after applying the cream. Will it really lift and firm? I don't know, but I'm guessing it's about the same as the Olay cream's chances of improving my skin. Overall, I like the increased SPF and the packaging over the Olay cream, but I prefer the thick formula and lack of perfumey smell of the Olay. I'd take the sunscreen scent over the perfume scent any day, but that's just my preference. I'll keep using the RevitaLift I bought until I'm done with it, but I'll probably go back to Regenerist at that point. That is unless someone else suggests a good day cream to try! It's been about a month since I bought RevitaLift and in the interest of total honesty, wanted to share an update. 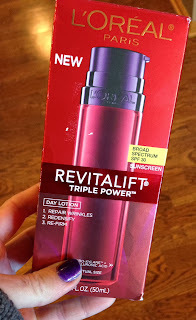 I really tried to like RevitaLift. I wanted to like it. The truth is the scent is way too overpowering. I feel like I'm drowning in scent, which means I can't really wear it on days I'm working or I'd bug anyone with a fragrance sensitivity and I simply don't want to have my moisturizer determine how I smell each day. 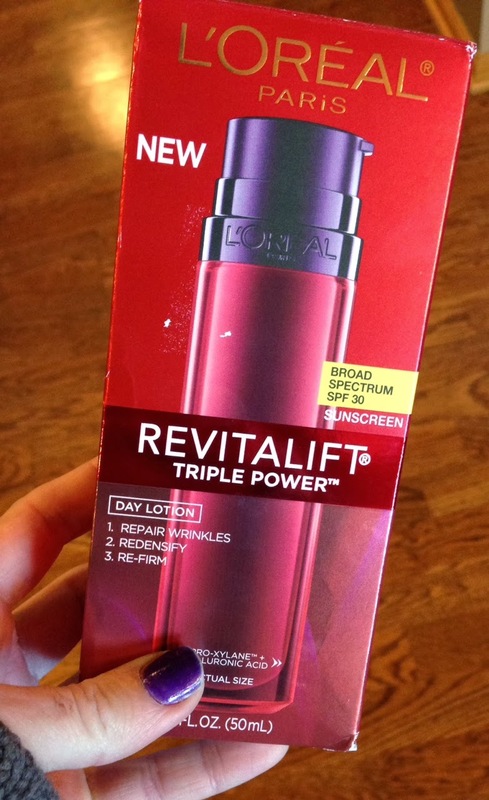 I also noticed my skin kind of gets red and irritated when I use RevitaLift. My assumption is that strong fragrance is an irritant. The biggest problem with RevitaLift compared to other moisturizers I've used is that it's super greasy. I feel like it never quite gets dry enough to put makeup on, so my foundation blends into the moisturizer (that's not a totally bad thing when I want light coverage) and I just feel icky. My skin looks shiny and that's not what I want. I've been using Beautiful AM for now, with excellent moisturizing results and no obnoxious scent. Because it has lemon oil in it, I'm hoping to find a new daytime moisturizer and use the Beautiful AM product at night only (ironic, eh?). I'm truly wondering why L'Oreal put a face moisturizer on the market with so much scent. Truly baffling.